Aww ur son is adorable and lovely birthday party and u r looking beautiful. And it seems like your maxi dress just matches what's on the pary itself, like the cake and decoration.. You look good, aren't you the star of the party for looking great like that? Awww, so much fun!! And you look beautiful! Congrats with the first birthday! It's unforgettable day, I know :) Babies are so interesting in this age! And of course I love your dress! Happy belated birthday, Baby T! Looks and sounds like it was memorable, Mica! You've done the best job a mother could do for her baby! Everything was made with love and so many adorable details and yummy food! Well done, darling, well done!! It was all worth it! <3 Happy Sunday, sweetheart!! hehe yep I took the easy way out and just embedded instagram pics in the post ;) Quicker than resizing and cropping photos down for the blog! Beautiful. I had a 'Where the wild things are' themed first birthday for our first son and now I am planning our second son's first birthday, I thought that it would be a good idea to also pick a book theme. I am thinking 'Where is the green sheep?'. They sound like wonderful themes, you really could have a lot of fun with them! Green sheep is a favourite book here too, baby loves it! Belated happy first birthday, Baby T!!! Awe your baby is ADORABLE! I remember when my kid turned 1 it was so exciting. I love the theme blue, simple but so cute. It looks like he had a great time, which is wonderful! They grow up so fast don't they? They do grow up really fast! happy birthday to baby T! i love all the picture decorations and you look gorgeous in blue! It looks like one is fun! 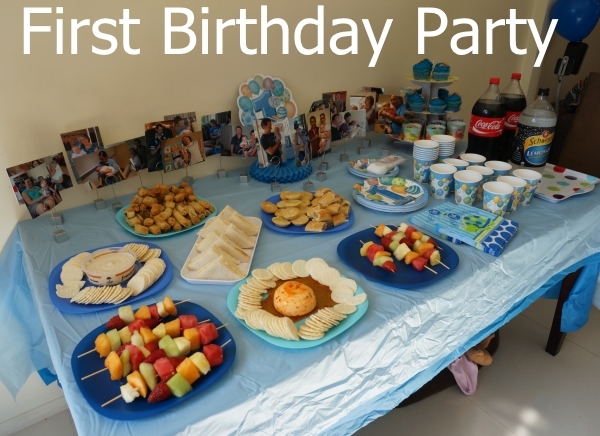 I love the idea of the photos and lolly bags, what a wonderful momento of the day and baby's first year! High five on the colour co-ordination! Awww, happy first birthday Baby T! Sounds like he had a great day, and I'm sure everyone at the party did. Love all your photo decorations, that is such a great idea! This is so precious! I just went to a one year old's birthday last weekend. Such a fun time + and you look gorgeous in blue! I cannot believe he is already one?! The party looks like it was great. Love your blue dress. I know! It just flies by! Love your dress and that necklace is amazing! You threw an amazing party for the little one and blue is totally a theme, I would have loved if you bought a blue wig haha! Aw happy birthday to your sweet little one! I love the outfit, I am such a House of Harlow fan. Looks like a great party! They are a lot of work but totally worth it. I love your photo decorations too! Great idea especially if you either don't share a lot of personal pics on social media or you have guests that don't use it. You looked great as well and I'm dying to know what the Clinique tip was!! Yeah I haven't been sharing pics on social media a lot of baby, so it's always good to give people photos, as often you have to reduce the size when you email them. So sweet! Happy 1st Birthday to Baby T. Such a special day. I like your blue dress! Aww, yay for a first birthday party! (And of course bittersweet tears as well.) I like the blue theme for Baby T - I think using a color as a theme is a great way to tie everything together without going too crazy with a theme! And that dress you wore is perfect! I remember seeing these on Instagram! Isn't it so unfair how fast they are growing up??? It's good though too of course. Love your outfit choice. Simple, movable and perfect for chasing a one year old! They do grow up so fast! As I said in instagram… blue IS your colour Mica - what a great choice. Looks like baby T and the gang had a good time. Thanks Lorena :) It's one of those colours I love to wear too! Happy Birthday to your boy! That dress looks great on you too! Thanks for linking up to Flashback Fashion Fridays! Poor Cooper hasn't been in a lot of pics lately! He's usually trying to catch up on his naps, having a chatty baby means he doesn't get his sleep as much as he used to, haha! Looks like a fun party! 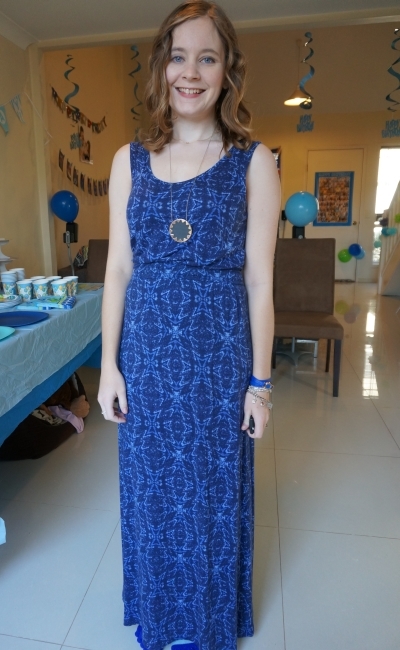 You look great in that blue maxi dress. I especially love your House of Harlow necklace! I'm so obsessed with their jewelry line. It's such a distinct style! Hi there. Stopping by from Modest mommy bloghop. I love your outfit, especially the necklace. And you had everything blue, so I belive Blue is a party theme :) lots of best wishes to the little one on 1st birthday.